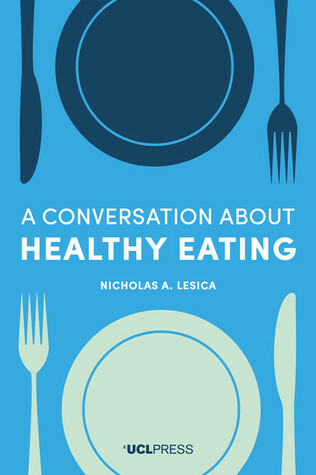 A Conversation about Healthy Eating is a non-fiction book written by a neuroscientist. It does exactly what it says on the tin - it discusses healthy eating, and the confirmed scientific consensus about eating, digestive processes and modern diets. I don't exactly recall how I stumbled across it, but I am very glad I did. The result is A Conversation about Healthy Eating: an overview of how the human body processes food, how various systems interact, and how various foods cause different responses. Lesica is not a dietician, so he was learning about the current state of knowledge in scientific fields that are only tangentially related to his own. He did all the work of reading up on in-depth science, but he decided to write the book not for other scientists. Instead, he wrote it for the general public. And by "public", I mean anyone above the age of 10 or so, in terms of the accessibility of the information and the language used in the book. When I read the description, I was intrigued. As anyone who knows me IRL can attest, I have my own problems with food, and I am trying to figure out how to address these. So a book that would give me a broad understanding of what goes on in my stomach, brain, liver and intestines is a perfect place to start. I will admit that it took me a few pages to get accustomed to Lesica's approach. He makes clear in the introduction that he uses a trick to prevent the reader from skipping or skim-reading (namely, exposing all the information in the form of dialogue - it is literally a conversation), and in the conversation itself, he sometimes aims at an audience perhaps a bit too ignorant (having the questioner ask "what is DNA" and "what are hormones", for example). That said, 99% of the time it works. The information is explained, convincingly and in just enough detail to understand, but never so much detail that it becomes overwhelmingly complicated. He makes very clear how certain or uncertain the scientific consensus is about any statement he makes. He adds references for every claim, so the reader can decide to read the original science. And he writes the book in a way that is not just conversational, but non-judgemental and empathetic. (I have never before read a book that understands what it's like to be me, when it comes to food, and this book does). Best of all, after going through all the detail about how the body works, he makes a few suggestions about how people (i.e. the reader) can improve their habits and eat more healthily. One of the biggest suggestions is to use the knowledge and some self-observation to come up with a bespoke, personal solution for oneself, which is what I am trying to do. I wish I'd read this book when I was young. I wish my parents had read it. And I wish it was on the national curriculum, so that every child about the age of 12 or so would read it. Because it is not just accessible, it is comprehensive, clear, and seems about as accurate as the current scientific consensus. In short, it is a perfect tool for us to understand this aspect of our own bodies.